On Saturday, June 15 June the Byron Bay FC Rams played hosts to Lismore Workers in both premier and premier reserve grades. The Reserve game was an evenly contested game in the first half with both sides battling for the ascendancy. The Rams played their normal possession game but found it difficult to break through the resolute Workers defence and went into the break at nil all. Some tactical and positional changes at half time saw the Rams take a more direct approach in the second half and it wasn't long before the Rams were in control of the match. Twenty minutes into the second half, Mark Greenslade latched onto a fine pass and his resulting shot beating the Workers goalkeeper. One-nil up and the Rams stepped up a notch with Yantra Whitling controlling the midfield and the defence of James Tomlinson, Brad Jones, Nathan Burville and Corey holding fast. 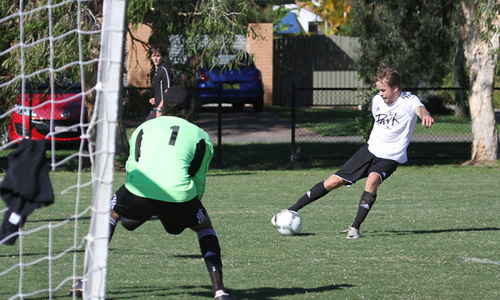 Chances became more frequent for the Rams and Layton Barton scored a second goal to seal the win. This was a fine team performance and, with the first round of the competition completed, the Rams are in the top four. The Premiers' game saw Lismore Workers pressuring the Rams early, but the Byron defence held fast. As the half progressed the Rams attack clicked into action and gradually took full control of the game. Chances started to come our way with Bruce Morhaus forcing a great save from the Workers keeper. Todd Knaus had a fine header saved as did Morhaus from a corner. Chances come thick and fast for the Rams and it seemed only a matter of time before the Rams would take the lead. The half time score was nil all and the second half saw the Rams in control with their free flowing style opening up the Workers defence. On one such raid, Morhaus broke through only be brought down in the penalty box. Workers talented young keeper Simon Cleaver stopped the dot shot and the score remained 0-0. The frustration of the game started to tell on players and spectators alike. Finally Sebastian Bell rocketed a right footed shot into the top of the net for a 1 nil lead to the Rams. With time running out and the Rams in total control the unthinkable happened and Workers equalised. The Rams' dominance of the game was unfortunately not reflected in the outcome. The Byron Bay premier team has also finished the first round in the top four and look forward to next week when they play Italo Stars in Lismore.